The Vietnam War's most highly classified special operations were performed by the Studies and Observations Group. Consisting primarily of U.S. Army Special Forces "Green Berets," SOG warriors fought top secret missions deep behind enemy lines. 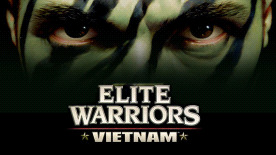 Infiltrate deep into Laos with your Green Beret and Montgnard teammates, hunted by trackers and bloodhounds, outnumbered at times 100-to-1. Rescue downed pilots, ambush convoys, seize enemy prisoners, discover targets for air attacks, and direct air strikes. See why SOG veterans went on to found Delta Force and in the work of secret operations, remain the stuff of legends. Take part in the top secret world of "Black Ops" unconventional warfare. Engage in highly classified operation throughout southeast Asia. Eight realistic campaigns that take place in multiple phases. Use combat patrol techniques learned in Vietnam and still valid today. Team building - train and equip your team and then lead them on covert missions.